Marvel’s Agents of SHIELD explores the back story of General Hale and her association with H.Y.D.R.A. while supplying information on her overall plan. I’ve mentioned in previous reviews that General Hale comes across as an underdeveloped antagonist because the show wasn’t delivering enough information to make her more interesting. 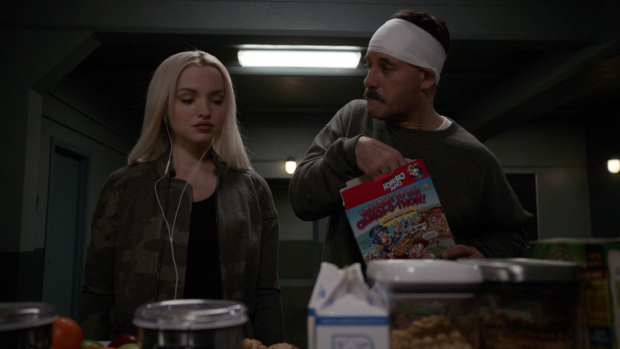 This episode solves that problem by spending the bulk of its time exploring her character and her motivations in ways that give her more than enough depth to help carry the remainder of the season. First of all we see a flashback to her last days at H.Y.D.R.A. 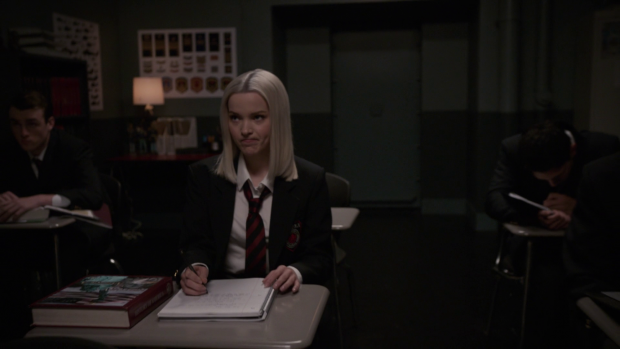 High School where her younger self (Alyssa Jirrels) along with her contemporaries Jasper Sitwell (Adam Faison) and Werner Von Strucker (Joey Defore) are anticipating their assignment following their graduation. The focus is on Hale though it’s fun to see a young Sitwell and learn that he was always the “middle management” type and that Strucker was always a wannabe despot. Young Hale is driven and ambitious with a strong desire to rise to the very top of the H.Y.D.R.A. hierarchy, so much so that she isn’t afraid to make radical suggestions to impress the top brass as seen during a presentation from guest speaker Daniel Whitehall. This flashback story serves as an uncomfortable reminder of how immoral and brutal H.Y.D.R.A. is as an organisation. Whitehall serves as a reminder of the absolute loyalty demanded from those in their ranks and bringing back the final test of killing a dog as described by Ward a while back reinforces how bereft of compassion or humanity they are. It’s a simple example of how attachment is perceived as weakness and it’s easy to see how encouraging attachment to a dog before challenging agents in training to sever that attachment would be an indication of loyalty. There’s a sliver of humanity in the aftermath of this as Sitwell is clearly distressed and there’s more than a hint that Hale didn’t find it easy either. Hale’s conversation with Whitehall about the plans H.Y.D.R.A. has for her reinforces how immoral they are. The absolute loyalty means that H.Y.D.R.A. can ask anything of them which in Hale’s case means that she is to give birth to a child that will be the future of the organisation. Hale objects to this because she has worked very hard to be considered for the top assignments and wanted much more out of her service than to be used for her ability to reproduce. She has no say in any of this because she has pledged her loyalty but it’s clear that she considers this a complete slap in the face. Whitehall sees this as an honour for her but Hale wanted more for the work she has put in. Alyssa Jirrels does a really good job in her scenes, managing to use enough of Catherine Dent’s mannerisms to connect the two versions of the character while projecting youthful enthusiasm. Spending some time focusing on the younger version of Hale helps humanise her as it provides insight into her ambitions and what circumstances prevented her from having. Another flashback shows Ruby going through the same training with it turning out differently. Unlike her mother Ruby refuses to kill her dog because she sees it as a ridiculous test. As far as Ruby is concerned it’s symbolic of everything that caused H.Y.D.R.A. to fail and in order to survive it has to change. It’s quite a heated argument that comes at the point where H.Y.D.R.A. was on the verge of being wiped out so Ruby’s point is pretty much proven by that fact alone. Hale ends up siding with her daughter’s point of view in that case by killing the last remaining H.Y.D.R.A. agent indicating that she agrees with the notion that things need to change. This flashback also gives us the first example of a true mother/daughter bond between Hale and Ruby. Hale is shown giving Ruby practical advice about what she should do with her life and delivers her lines in a softer tone than we have previously seen, further humanising her in the present day. Up until now their relationship has been troubled so it’s good to see that it hasn’t always been this way and that Ruby has a bit more range than we have previously seen. Seeing how she was trained also offers justification for her cold and detached attitude as she has been encouraged to ignore her humanity in favour of the cut throat H.Y.D.R.A. philosophy. It turns out that Ruby was born and raised to become a H.Y.D.R.A. super soldier but her independent streak means that she might not be the most viable candidate. Her loyalty is in question because she speaks out against the dogmatic training and rules. Hale herself is worried about Ruby’s potential to be exactly what H.Y.D.R.A. is looking for despite her obvious skills and clear discipline. Flashbacks also reveal where Talbot has been this whole time. Being shot in the head by the Daisy LMD has caused significant brain damage meaning that he is no longer in control of his emotional state causing his wife and son to be afraid of him. There’s a tragic aspect to Talbot’s contribution to this episode because his brain damage means that he is prone to aggressive mood swings and he is taken from a position of authority to a situation where he has no control whatsoever. He is brutally tortured and forced to reveal where he stashed everything confiscated from H.Y.D.R.A. as he was putting an end to the organisation. Once he reveals everything he is kept around to serve as a warning for what Coulson can look forward to. This comes after Talbot defiantly insists that Coulson will save him. In the present day, Coulson experiences the same welcoming treatment that Talbot experienced as well as Wolfgang Von Strucker -or Alex- experienced in “Principia“. This treatment feels sinister in itself because of how uniform and enigmatic it is. Everyone wakes up in a room containing only a bed before finding a breakfast buffet and meeting Ruby who ignores them. The whole thing promotes a sense of isolation and uncertainty as a form of torture. Feeling alone and unsupported goes a long way towards inducing paranoia and making someone more malleable. Of course it doesn’t work on Coulson because he has been through too much to let this bother him. He cracks jokes and generally shows how unimpressed he is by this whole thing indicating that Hale will have to step up her game to get to him. Hale isn’t interested in breaking Coulson as such because she is more interested in working with him in order to stop the destruction of Earth. She’s very forthcoming with information about the Confederacy and the knowledge she has about the threat that’s coming to Earth. Hale has forged an alliance with the Confederacy because they have promised to protect Earth from a large scale conflict that is heading right for it. Fortunately she’s allowed to be a smart antagonist and recognises that the Confederacy might be a threat that they need to deal with as well so working with them is a form of lip service on her part as she wants to be ready for everything. The Confederacy are interested in working with H.Y.D.R.A. because they can supply Inhumans who can serve as effective warriors in the upcoming conflict. This is where S.H.I.E.L.D. comes in from Hale’s point of view as they know how to find the Inhumans so can definitely be of use. At this point it’s in Hale’s best interests to find a way to work with Coulson though there is still mistrust on both sides. It’s interesting to see their interactions play out as Hale doesn’t seem to be aware that Coulson is completely in control of them. She gives all the information while Coulson asks questions and volunteers nothing in return. He even taunts her by revealing that he was the one to kill Whitehall further showing how he and his team have managed to defeat H.Y.D.R.A. at pretty much every turn. Clark Gregg and Catherine Dent bounce off each other wonderfully preventing their scenes from being more than simple exposition. 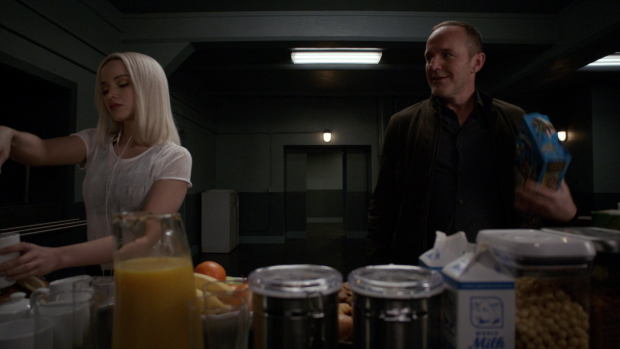 Hale tells Coulson that Ruby might not be the best candidate for Whitehall’s machine because of her questionable loyalty. She suggests that Daisy may be the better candidate because she has demonstrated all of the necessary qualities and that Whitehall detailed. It is suggested that S.H.I.E.L.D. made her into the ideal candidate causing Coulson to object because they never made her do anything. The main difference between the two organisations is choice. One of them allows people to choose and the other doesn’t so Daisy becoming a great soldier and agent was something she did so on her own with the help of others rather than being forced like Ruby has. This makes me think that Ruby will become an antagonist for Daisy towards the end of the season now that Ruby has been noted as a mirror of her in several ways. My prediction is that Ruby will go into Whitehall’s machine and the battle that decides the fate of the Earth will be between Daisy and Ruby. The reveal that Whitehall’s project was called “Destroyer of Worlds” rings the necessary alarm bell for Coulson. Daisy was known by that name in the future meaning that this serves as a prediction of how the end of the world comes about. This is the only point where Coulson gives up any information as it proves necessary to do so in order to save the world. Whitehall’s machine answers the question of how Daisy could gain the power level necessary to destroy the planet and the answer of how to prevent it is as simple as never using it. I really like how this part of the season is slowly revealing information that points towards the apocalyptic future. Another interesting thing is that the idea of using the machine seems noble enough on the surface. Giving an individual enough power to make alien threats think twice about attacking Earth is a reasonable idea because otherwise they might see Humanity as an easy target. 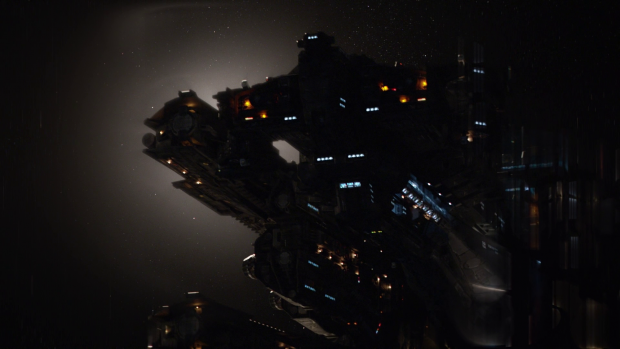 The episode fails to address that the Avengers could also serve as that deterrent to outside forces but the show is working with the materials available to them rather than taking a solution from elsewhere in the universe. It remains to be seen if Hale can be trusted to do the right thing though it seems likely that her desire to save the Earth is genuine and any complications will come from Ruby going rogue. Very little time is spent with the other characters but the fallout from Fitz’ actions last week are explored. For now he’s kept locked up because he can’t be trusted and Daisy goes so far as to consider him H.Y.D.R.A. The truth of the matter is more complicated than that but it’s clear that Daisy seeing it in more simplistic terms is helpful for her. As with the previous episode Fitz’ justification for his actions is difficult to deny especially when considering that the rift’s influence was growing and it wasn’t long until the town above the base was affected. Action had to be taken and Daisy’s lack of willingness to restore her powers was a barrier to solving the problem so Fitz made an unpopular decision for the greater good. Mack adds some further context to what the Framework does to people. Simmons can’t understand because she and Daisy went into the Framework as themselves where everyone else was altered in some way. Mack tells her that the Framework created an alternate version of the person that went inside so in Fitz’ case he was still a good person who was altered rather than uncovering a bad person that always existed. It’s an interesting perspective as it points out that the Framework changes people by altering the potential that someone has into what the program needs. As such, Framework Fitz is a perversion of the base personality that is innately moral. This could be the angle that allows for forgiveness as people can come to realise that Fitz is still fundamentally a good person. Daisy is unable and unwilling to accept that but at some point she may have to consider that difficult choices have to be made especially if she’s taking on more of a leadership role. The start of that is evident here when she decides that bringing Robin out of hiding is necessary to help them figure out their next move. This is another example of the future coming true as this is exactly how it played out in previous loops. One thing is clear for now, Daisy won’t be forgiving Fitz for what he did anytime soon. There isn’t enough time in this episode to properly establish Daisy’s approach to leadership so it does feel like something is missing there but her emotional state is very well done. 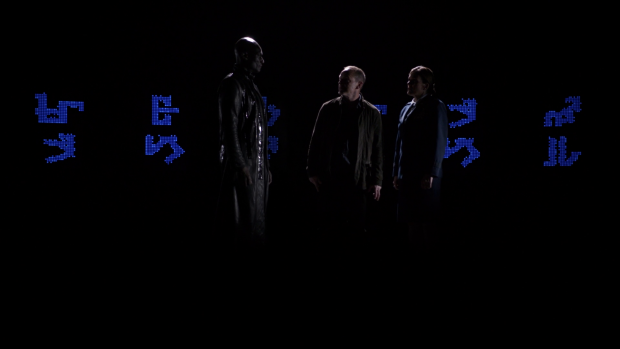 Following on from the reveal that Deke is Fitz and Simmons’ Grandson, Simmons considers the implications of that when Mack points out that Elena considers herself invincible because she knows for a fact that she survives until the very end of the time loop so doesn’t see any danger connected to her current situation. Knowing this causes Simmons to look at things differently and realise that she and Fitz both survive to raise a daughter who then gives birth to Deke. If they are caught in a time loop then this makes a lot of sense as knowing the future can be comforting because they now know their actions don’t result in their death for a long time. The scene where she and Fitz discuss this is really amusing with Fitz’ disappointed reaction to the knowledge that Deke is his Grandson. Of course the current aim is to stop the world from ending meaning that they are trying to prevent the events that make that knowledge valid so this further builds up the tension for the coming episodes as the team can’t operate on the mentality that they know what’s going to happen otherwise it means they’ve already failed. An excellent episode that solves the problem of General Hale being an underdeveloped antagonist. The episode uses flashbacks to show her time at H.Y.D.R.A. High School and reinforces how brutal they are as an organisation. The disappointment that her assignment involves her giving birth to a child that H.Y.D.R.A. can use to become a super soldier in the future comes across well as does the conflict between her loyalty and her own ambitions. Further flashbacks add layers to her relationship with Ruby as well as reveal where Talbot has been all this time. Hale’s interactions with Coulson are well handled and flesh out the Confederacy along with Hale’s plan to save the planet that may end up being the cause of it. It certainly adds complications to the whole thing and seems to establish that Ruby will soon go rogue in opposition to her mother working with Coulson. Very little time is spent with the other characters but what we do see is interesting. Daisy is trying to be an effective leader but can’t bring herself to forgive Fitz after what he’s done and doesn’t seem to accept that hard choices will have to be made in order to save the world. There isn’t enough time to fully explore Daisy’s approach to leadership so it doesn’t work as well as it could but the emotional side of it is well handled. Simmons realising that if the future can’t be changed then that means she and Fitz are invincible works well and creates and amusing reaction from Fitz after finding out that Deke is his Grandson. Of course the team can’t operate on the mentality that the future is written because their current purpose is to prevent that future from coming to pass.